Though we may not think about them as we hurriedly pass them on the highway, freight drivers have some of the most important careers in our world to date. They transport necessities such as food, materials for housing, and potable water, and they do it safely while driving an oversized vehicle that can weigh up to 40 tons. While freight driving does come with its fair share of stress, there are many benefits that come with driving freight. In today’s blog, Freight All Kinds, the leader in freight management and freight solutions, will go over some of the benefits you’ll have when you drive freight. While some careers may leave you wondering if you’ll even have a job tomorrow, being a freight driver comes with some of the best job security around. The freight driving industry is an incredibly secure market, which helps give you the peace of mind that will not only help you do your job well but will keep you happy and engaged with your job. On top of this, there is actually a shortage of freight truck drivers in the United States, which gives you even more job security and peace of mind. If you have a clean driving record, or at least a number of years of safe driving with nothing more than a few minor infractions, you can have a job in the freight driving industry. Where in most other jobs you don’t get a say in what you do, when you’re a freight driver, you get a flexible schedule that you get to pick. Most truck drivers will be able to choose many different aspects of their jobs, such as what type of hauls they’d like to carry and what kind of runs, local, long distance, or cross-region, they’d like to do. Some companies will even let you switch your jobs after a few months or even as you see fit. You decide which routes you run with how much freight you want to haul. Are you tired of sitting in the same office day after day with little to no change? A job as a freight driver will allow you to see the scenery around your area, your state, or even around the country. You’ll travel to new and beautiful places every day while also meeting new people with every job you complete. Every day you’ll drive to a different area or place, seeing more and more of your state or country. You’ll get to know your area, state, and country better when you are a professional truck driver, especially compared to a job sitting at a desk every day. Though it may not be thought of as a high paying job, truck drivers actually make great pay in their careers. Most companies give great base pay from the very start, which will only increase as you stay with the company. 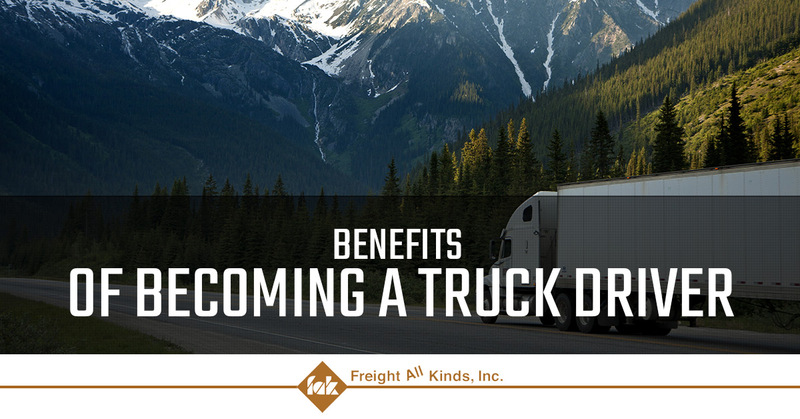 You can also make more if you’re a reliable and safe truck driver, as the company will want to reward you for your outstanding efforts. If you decide you want to be a long-haul driver, you can earn quite a bit since the jobs are much longer than area or state hauls. Most companies will also give out bonuses and increased pay for the drivers that perform the best and stay with the company the longest. Most full-time employees will be given benefits, such as medical, dental, vision, and more, at just about every company. However, most freight companies will offer this and more to their employees. Not only will you get the basics, but you may also receive other benefits like life insurance, retirement plans, paid vacation, and even holidays. Some companies can offer partial or even full coverage for benefits like medical, dental, vision, and more. We here at Freight All Kinds hope you’ve found this blog to be helpful and insightful. If you’re looking for the best freight solutions in the United States, then the experts at Freight All Kinds are ready to help you. Learn more about Freight All Kinds, see what kind of careers we currently have available, or contact Freight All Kinds today to answer any questions.